What does the word “Rumspringa” mean? What does the word Rumspringa mean? 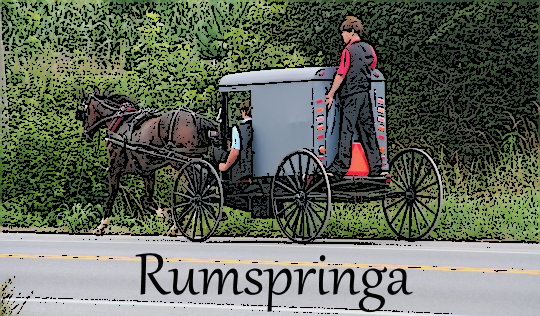 Rumspringa literally means “running around”. When speaking of the period in English, Amish are more apt to describe their youth as “running around” rather than, say, “being in Rumspringa” or some similar description. It does not explicitly mean a time to “get wild”, “sow oats”, or “taste the world” (even though that is what some Amish youth end up doing). It’s a period in which Amish youth engage in increased social activity, and in most cases it ends with joining the church, marriage, and settling down. 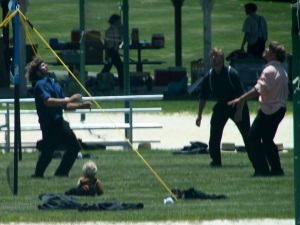 Are Amish youth encouraged to behave badly during Rumspringa? No. This is a myth. Amish parents accept that their Rumspringa-age children may test boundaries before deciding to join church. However they do not “encourage” their young to sow wild oats or engage in sinful behavior (not unlike how most non-Amish parents raise their children). 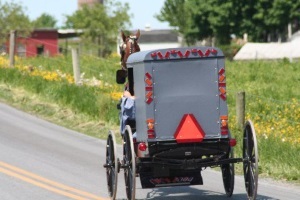 Amish youth often customize their vehicles with reflectors. As one Amishman says, “When a young person decides to be rowdy and engage in deviant behavior they are making a choice of their own. Certainly not at their parents’ behest or suggestion.” (see “Rumspringa-Myths and Reality“, an article by an Amish father on this website). Do Amish youth have to “follow the rules” during Rumspringa? Technically not church members but not completely under the influence of their parents, Amish youth do have leeway to push boundaries. They do so in various ways. These can include wearing non-Amish clothes and hairstyles, participating in parties and “English” activities, using alcohol and other substances, and even acquiring a driver’s license and vehicle. It’s important to note that not all Amish youth participate in such ways however, and many if not most Rumspringa experiences are tamer–much tamer–than that depicted in much of the media. Participation in youth and singing groups, sports activities, and taking trips with friends are more common and more acceptable youth behaviors. Why is Rumspringa important? Rumspringa is often understood as a time when Amish youth are deciding whether or not to be baptized as Amish church members, a lifelong commitment with tangible implications if broken. It’s clear that the Rumspringa period is important as a time to find a potential spouse. Since the Amish church requires baptism before marriage can occur, when couples are seriously dating, baptism can in most cases be considered a foregone conclusion. Read more on the meaning and purpose of Rumspringa. Do Amish youth leave home during Rumspringa? This is uncommon, despite portrayals to the contrary in the media. Rumspringa-age youth typically live at home until after joining the church and then getting married and moving into their own homes. Why do Amish have youth groups? Youth groups offer Amish adolescents a formal peer group with which to socialize on a regular basis (usually weekly) following church service. The way Amish youth socialize in their groups varies widely though, depending on how “fast” or “slow” their particular group is. Slower groups revolve around the Sunday evening singing, which is often adult-supervised. Faster groups may engage in parties with live or recorded popular music, alcohol and even drugs. Youth groups may have creative names, such as Lancaster County groups called “Parakeets”, “Cherokees”, and the “Quakers” (see Richard Stevick’s Growing Up Amish: The Rumspringa Years, p. 117-118 for a discussion of the Quakers gang). Amish parents have encouraged adult-supervised and morally upright activities for their youth, especially following highly-publicized incidents involving Amish youth and drugs. One such initiative among concerned Amish parents in Holmes County, Ohio is known as the “Midway” movement (see An Amish Paradox, p. 74-77). What is a “Buddy Bunch”? In some places including the Lancaster County settlement, a Buddy Bunch describes a peer group within a youth group or “gang” as it is known in some places. Donald Kraybill describes the term in The Riddle of Amish Culture as “the cohort of twelve to twenty youth that join a gang in a particular year.” Furthermore, as “the primary peer groups for teens, Buddy Bunches often continue meeting throughout their lives” (see p. 146-147). What happens at a youth singing? Youth gather in the afternoon, typically at the home of the family which held church that day. Volleyball games may be played at various nets set up at the property. Dinner is provided, and in the evening a group singing commences, typically lasting around 2 hours. Youth typically play volleyball before the Sunday singing. Amish parents and other family may attend, particularly in so-called “supervised” groups. Songs are sung from various hymnbooks, in German and in some cases in English. Participants pass around water and snacks for refreshment during the singing. Following the singing, Amish youth socialize and couples may pair off to leave on dates. Read an outsider’s account of attending an Amish youth singing. Do Amish use smart phones? What about Facebook? Some Amish do use cell phones, particularly in more progressive communities. Cell phone use is most common among youth, but adults also use cell phones, particularly business people who find them useful as a tool for management and customer contact. Since many phones are internet-enabled, some Amish do go online and some Amish youth have Facebook accounts. See Richard Stevick’s work Growing Up Amish: The Rumspringa Years for a current account of smartphone and internet use among Amish youth. Do Amish youth get into trouble during Rumspringa? Like other adolescents, some do. Occasionally, bad behavior by Amish youth makes the media. These are typically stories involving parties, underage alcohol possession, and sometimes DUI arrests. What do Amish youth do on dates? Amish dating practices vary by groups. A typical first date is arranged when a young man asks a young lady if he can give her a ride home following a Sunday singing. Amish teenage boys get their first buggies at a similar time as American males get their first cars – on turning 16. In contrast, young Amish females rarely have their own buggies. Some Amish youth may go on dates in a more “English” style, including going out to eat or attending concerts. Do Amish practice bundling? “Bundling” or bed courtship is practiced by some Amish in the plainer communities. Bundling is a colonial-era custom which was historically practiced not only in Amish culture but among non-Amish as well. It is known in the PA Dutch dialect as Uneheliche beischlof. The practice involves a dating couple laying together on a bed, fully clothed, where they are expected to talk together into the wee hours but abstain from sexual activity. Bed courtship is a minority custom with which many Amish will have no experience. Amish may even be embarrassed to be associated with the practice. See Growing Up Amish, p. 229-230 for a more in-depth discussion of bundling. “Amish buggy driver charged with DUI.” Associated Press. The Patriot-News/Penn Live, 8 Dec. 2009. Web. Accessed 27 Mar. 2015. To Cite this Page: Wesner, Erik J. “Rumspringa.” Amish America. Erik Wesner, 8 Apr. 2015. Web. [Date Accessed]. <http://amishamerica.com/rumspringa/>. Image credits: Youth on buggy- Ed C.
Here in Holmes among the various groups of ” singing youngie ” we have volleyball games on Fri. nights. During the winter we have other activities, such as caroling, game night, knotting comforters for relief missions, benefit auctions,etc. On Sunday nights we gather around 5:30 and have supper, then hymn singing till 8:30.We sing some German & some English. Then after a period of visiting we head home.A boy with a girlfriend will take her home, then visit for a little while before heading home.There is no bed-courtship ! Thank God. We would consider this very inappropriate. Youth standards in our groups are much higher than 40 yrs. ago or so , for which we praise God. 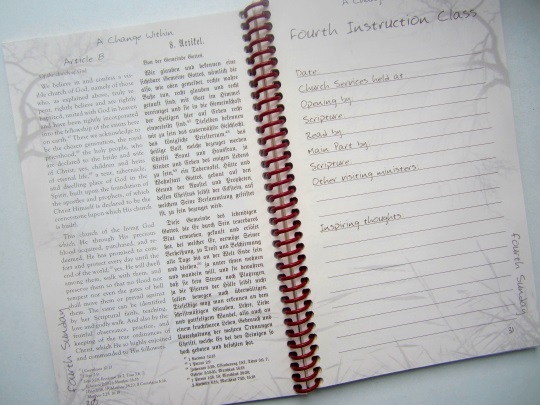 Where can you purchase A Change Within Journal? Maureen I picked up the one in the photo above I believe at Gordonville Book Store in Lancaster County. I would bet it is also available via Raber’s Book Store in Holmes County, OH, which does mail order. Here is info on Raber’s including contact/order info at the link below. The price if I recall correctly was around $10 but you might want to confirm that first or send a little extra cash to cover any difference.